WeetHet - CDRW - How do I make my own CDROM? 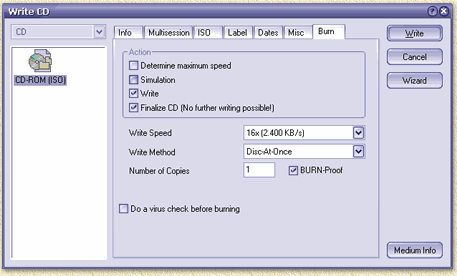 Nero Burning ROM of Ahead is versatile program and is created to make your own computer CDROM's (=Data CD). Basically a data CD, or CDROM, is nothing else but a collection of computer files, just the same way you can find them on the harddrive of your computer. Note: Read the disclaimer first! Copying software can be illegal! Starting - Wizard or no Wizard ? I will walk through Nero using version 5 dialogs in order to create a data CD. While reading this you can already try it, simply click the Nero Burnin Rom icon. You can find the icon, if you installed Nero, on your desktop and/or programs-menu. You can decide to use the wizard from now on (the easiest way), or close the wizard by clicking "Close Wizard". If you decide to continue with the wizard, then click "Compile a new CD" and click "Next". You will have no need for the following page(s). If you don't want to use the wizard, then keep reading. CD-ROM (ISO) - Multi-session ? Here we can choose of we would like to make or continue a multisession CDRom or not. This is a feature in which you can add files to this CDRom later on (so after you bruned this one, you still can add files). 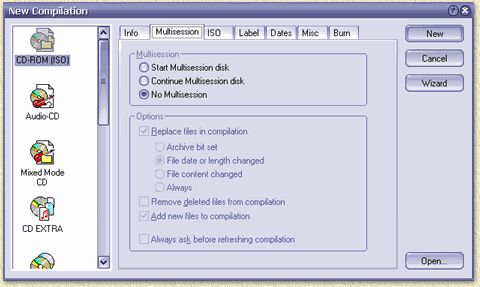 If you would like to continue Multisession, then choose "Continue Multisession disk". If you want to start one choose "Start Multisession disk", otherwise choose "No Mulitsession". If you want to continue a multisession CD, several options are available: remove all previous files (remove all checkmarks), add new files ("Add new files to compilation") and/or update of previous files ("replace files in compilation" and "Remove deleted files from compilation"). I usually use "No Multisession" since this can be handled by all (even ancient) CD-players. First we choose "File-/Directorynames length". There are 2 options ISO level 1 and 2. - Level 1 can only handle the old DOS format filenames: 8.3. So 8 character, dot, 3 characters. As you probably will agree: rather limit for these days. Microsoft came up with different solution for that limitation, and called it "Joliet". - Level 2 allows filenames to have (position of the dot doesn't matter anymore) 31 characters. This mode is also known as "Romeo" mode. To remain compatible with DOS I always choose Level 1 - more about filenames later on. - Mode 2 uses a slightly different error-correction - offering more disc space. To remain compatible I always choose Mode 1 here. "Character Set" offers of the choice between characterset ISO 9660 (recommended), DOS or standard ASCII. Next to the field "Character Set" we see an additional option called "Joliet". This option generates a secundairy filesystem. This means that on your CD, 2 directory-trees can be found. 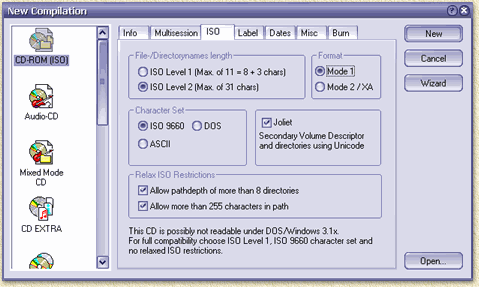 One standard "ISO9660" directory, with the short 8.3 names, and a second one in the so called "Joliet" format. Joliet is something Microsoft thought of when they introduced Windows 95 for the purpose of using long filenames. We check this option !. 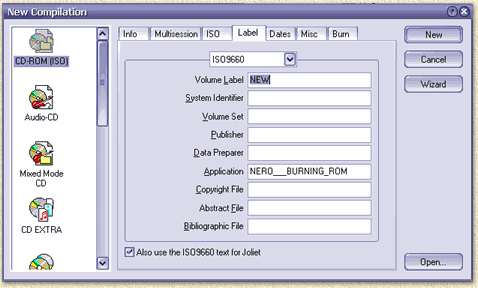 Systems that cannot read Joliet will only see the ISO9660 directory, thus being the most compatible mode. To remain compatible, I always choose "ISO 9660" and check "Joliet". Next option is the so called "Relax ISO restrictions". Both options are checked, leave it that way. ISO9660 is rather limited in it's path lenght (255 characters maximum) and directory depth (8). The next tabsheet "Label" (older Nero versions call this tab "Volume Descriptor") offers you space to enter some info about the CD. Unfortunally I have not seen ANYONE using this information yet except for the volumen label. Volume label, or: what name should the CD have ? When entering a label here, you will notice that you cannot enter spaces or lowcaps characters, this is thanks to ISO9660. ISO9660 equal to JOLIET ? Its is possible to enter an alternative disc label (allowing space and lowercaps characters) since this is supported by the Joliet format. Uncheck the "Also use the ISO9660 text for Joliet" option. If we select "Joliet", the field "Volume Label" can now have an alternative name. The tabsheet "Dates" offers us some slack in fiddling with time and datestamps of files and directories. I usually do not change dates here since the dates are a good indication which version/how old a file is. The tabsheet "Burn" will not be used yet, click "New" to start your compilation. Some important indicators before we proceed, first of all we see a progressbar in the lowerpart of the Nero window. This bar indicates how much space is used so far expressed in MB (MegaBytes). By default these lines are set pretty good, only change them if you find it really necessary. The positions can be changed using "File" - "Preferences". In the upcoming dialog, in the tab "General" the values can be adapted. Here the tabsheet "Expert Features" offers you "overburn" settings as well. On a 74 min. CD, I usually do not exceed 76 minutes and 20 seconds. Below the progressbar you will also see what the "active" CD-recorder is, in my situation, a "Plextor PX-W1610A". The actual "placing of files" is done using "drag and drop". Files and directories from the "File Browser" window can be dragged and dropped to the "ISO1" window. 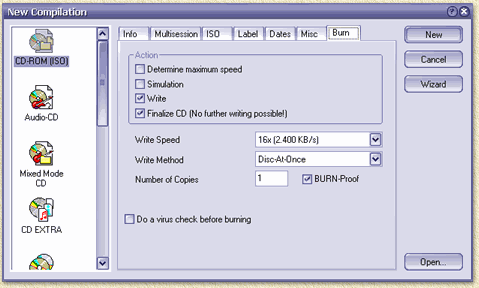 Files and directories (including the content of the directories) are placed on the CD. As an alternative, you can use Windows Explorer as well, just drag and drop the files from the Windows Explorer to the "ISO1" window. None of the original files will be moved or harmed in any way. As you soon will notice, the drag and drop principle is an excellent technique to create chaos. Renaming files or directories might be something you would want (the original will not be changed). Select the file or directory in the "ISO1" window which you would like to rename (one at a time!) using the left mouse button. Press the F2-key and enter the new name. Alternatively you can select the file or directory name using the right mouse button. Select "rename" from the popup menu. Tip: you can also change the CD-label using F2 or using the right mouse button. You can also create new directories in the "ISO1" window. Click with the right mouse button in the "ISO1" window and select "Create Folder". Similar as a rename, you can now type the name of the new directory. It is advisable to only use files form your local harddisk and NOT from floppy, cdrom or network. Often these devices are too slow, causing a "Buffer Underrun". BurnProof writers will not be harmed by this, but will go very slow. Avoid using other programs while burning, these might contribute to a nice "Buffer Underrun" as well. Don't forget that Virusscanner, unzippers, screensavers etc are programs TOO! I personally prefer SCSI recorders, but IDE/ATAPI should work OK too. If you are using an IDE/ATAPI recorder then you might want to make sure that it's connected as the MASTER device of the de secundairy IDE-port. Files then should not come from the same (secundairy) IDE-port, since IDE seem to have a hard time "sharing" resources which might cause an "Buffer Underrun". Check if the CD-Rom is "clean". Remove dirt, fat, etc. since these are excellent helpers in creating unreliable copy's. Note: use a dry cloth moving from the inside of the CD to the outside! Do not use cleaning substances and do not move in circles ! OK, now whe have read that, we can start writing, click the "flame" icon ( ). Tip: Use the button "Medium Info" (older Nero versions call this button "CD Info") to see information of the CDR or CDRW. Determine maximum speed Usefull for the first time, just to see how your PC performs. Simulation Simulate a burn, also good to see if everything goes well. Finalize CD This is to close a CD, meaning that you cannot add anyother files. This also means that other programs will identify this as a regular - non-recordable - CD. It's safe to use this always, even with rewriteables. The CDRW can still be "reformatted" after using this option. Write Speed Writing speed - try the highest availble speed (depends on your recorder's capabilities - use Simulation mode to determine if this works OK on your PC). Write Method In general it's advisable to use Disc-At-Once (DAO). In particular Audio-CD's can have a better transition from one track to the other! Disc-At-Once cannot be used for VideoCD's ! Number of Copies How many copies do you want to burn? Use Multiple Recorders Use multiple recorders simultaniously. This is only advisable when using identical SCSI recorders. IDE/ATAPI recorders are not (yet) very suitable for this due to IDE limitations. Cache Disk- and Networkfiles If you use files from floppy and/or netwerkdrives, the this is a very good option to activate. Cache files smaller than Leave it at 64 Kb, small files are a hassle for your computer (lot of seek-time) which might cause Buffer Underruns, so leave it at 64 and leave it checkd. Click "Write" to start the burning process and don't touch your computer for a while now.